PerfPRO Studio with one CompuTrainer™ and two stationary trainers. Any smart trainer broadcasting the ANT+ FE-C signal can have its resistance controlled by PerfPRO. These trainers require a single ANT+ stick. Multiple ANT+ sticks may be required for studio use, depending on the number of trainers you plan to connect. Refer below to the list of common Smart FE-C trainers. For studio use, please refer to the Smart Trainer Studio Setup guidance doc. Requires a single ANT+ stick. More ANT+ sticks may be required when connecting many trainers. Please read the KICKR Studio Setup documentation for more information. Requires serial port (COM) communication. Please be aware RacerMate has closed its doors and no longer supports their trainers. Requires TWO ANT+ sticks regardless of the number of riders. The two stick solution takes care of both the single rider and studios using more than one PowerBeam. Requires a minimum of TWO ANT+ sticks, depending on the number of bikes used. Requires a USB cable connection. Their new R1 trainer is considered a "Smart ANT+ FE-C" trainer so it requires an ANT+ stick. Concept2 Rowers with the PM5 or newer monitor. Requires the latest firmware so the PM5 broadcasts the ANT+ FE-C signal. Read more below. The following is a list of common FE-C trainers PerfPRO can control electronically. If your trainer is NOT listed and broadcasts an ANT+ FE-C signal it WORKS with PerfPRO. Please make sure your trainers have their latest public firmware installed prior to pairing with PerfPRO. It is also important you are using the more modern USB2 or USB-m ANT+ stick. *KICKR trainers may be connected as Smart trainers rather than their native signal. This will be required later when using the CLIMB with ERG workouts. The following is a list of common indoor bikes and spinners that may be used with PerfPRO to display and record data. PerfPRO cannot control the resistance on these bikes, but as long as your indoor bike broadcasts ANT+ signals then PerfPRO can pair up with them and allow structured workouts. These bikes broadcast both an ANT+ Power Meter with cadence and a Speed sensor. Newer models that broadcast its ANT+ power meter may be used. Any other indoor bike that broadcasts the ANT+ signal usually works with PerfPRO. PerfPRO Studio allows for single to group treadmill use. With the use of an ANT+ foot pod you may view speed/cadence stats (and anything else) while running on your treadmill. For structured workouts like FTP% workouts, PerfPRO instructs runners what speed they set the treadmill at based on a percentage of their threshold PACE. Unique treadmill data displays are available to each runner. It ends up being a very interactive/structured workout that tends to cause time to fly by no matter the distance. Another cool thing PerfPRO Studio provides is the ability to include turbo (non-electronically controlled) trainers. With any number of ANT+ devices (cadence, cadence/speed, HR, power) you may view and record data with PerfPRO and get in some highly structured workouts. PerfPRO Studio allows for single to group rower use using the Concept2 rowers. Rowers using the PM5 monitor broadcasting the ANT+ signal may be used with PerfPRO Studio to do single to group workouts. With these rowers you have the ability to measure power and strokes per minute during the workout. 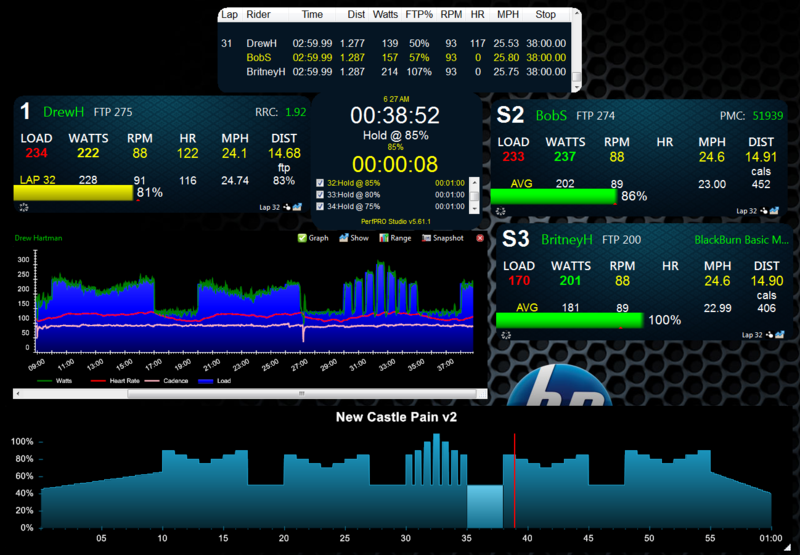 PerfPRO Studio then shows more specific rower stats like Pace/500m and distance in meters rather than mph or kph. With that, PerfPRO Analyzer then gives more rower-specific stats to analyze and report on. Some of you may have seen this before as virtual power. If you have an ANT+ speed or cadence/speed sensor you can get power readings without the use of a power meter. The numbers will not be as accurate as a power meter or smart trainer, but the numbers will be fairly consistent from workout to workout. So if you're really not up to spending a ton of cash on a power meter or smart trainer then this is a really good option. Just keep your rear tire pumped to its max pressure (e.g, 110psi) and keep the trainer's tire resistance / press-on force the same you'll get consistent readings workout after workout. As mentioned above, PerfPRO Studio can get power readings based on your speed sensor. Because fluid trainers get harder to pedal the faster you go a mathematical formula can be applied to calculate these power readings (aka Power Curve). The Bike Geek does a nice job of explaining this. These formulas are generally supplied by the trainer's maker so the data is fairly solid. As long as you select your brand name of trainer and have a speed sensor assigned to that ridsplay you're good to go. In time, more and more trainers will be supported as requests come in.